Add a charming complement to your traditionally-styled bed with this lovely night stand. It gorgeous Cognac finish is beautifully accented by its detailed edges, shaped feet, and classic hardware. It features three drawers, perfect for keeping your pajamas, bedside reading materials, or other items. Place a family photo and a reading lamp on its top and put this night stand alongside your bed for a perfect accent piece. The Chelsea Club Bywater Three Drawer Night Stand by Century at AHFA in the area. Product availability may vary. Contact us for the most current availability on this product. The Chelsea Club collection offers a distinct regal flair that will create a sophisticated décor in your home. The rich cognac finish is timeless and rich with traditional elegance. Brilliantly enhance your living room with the occasional tables, adorn your dining room with the rectangle leg table and variety of chair options, give your bedroom a gorgeous centerpiece with a poster bed, or add a luxurious touch to your home office with the monk's house writing table. Accentuate the traditional beauty of your home with the Chelsea Club collection. 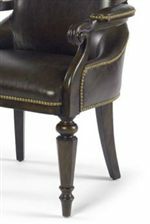 The Chelsea Club collection is a great option if you are looking for Traditional furniture in the area. Browse other items in the Chelsea Club collection from AHFA in the area.